Debt and wealth in a monetary system, part 2: discounted valuation issues in a declining frame with inequalities. Within portfolio structure and relative to the liquidity and capital security dynamics of liability streams. All of this tied to the relationship between frame transitions, emergent properties and structural imbalances and unconventional monetary policy focused overly on asset price support. I write with reference to a discussion in a recent Bloomberg View article, We’re Still Not Sure What Causes Big Recessions. Debt/broad money supply is a key foundation of asset and human capital values and their supporting GDP flows. Because of this, wealth and debt effects (new loans create deposits) on GDP/income flows should not be considered as separate forces. Debt in its money supply origination (bank deposits) is a foundation of both GDP flows and asset values and it is when debt, and specifically in the form defined, increases relative to GDP/national income flows that we should pay attention. And we need to pay attention to all flows, not just income flows on risky assets, for example corporate profits which can squeeze out returns on both fixed interest and human capital during periods of enforced low interest rate policy. Money leverages many activities, and asset values are always to a certain extent in a form of a bubble, but excess leverage, especially during periods where we have structural imbalances and frame transitions creates instability and risks to the financial system. Frame transitions that we need to watch out for with respect to excess asset focused money supply growth are where drivers of GDP growth are in decline (labour and population demographics, productivity and global transitions impacting the same) requiring lower levels of capital or growth rates of capital accumulation resulting in increasing levels of capital depreciation. In this context monetary frame dynamics should also be contracting or slowing. Frame transitions can be accentuated by increasing income and wealth inequality, something that may also be an emergent property of economic systems during frame transitions. This can also leverage asset prices to prospective GDP flows. In last week’s “Decision Making at the Federal Reserve” at the International House of New York Janet Yellen said that the US economy had made tremendous progress in recovering from the damage caused by the financial crisis, that labour markets were healing and that the economy was on a solid course. She also said the economy was not a bubble economy, and that if you were to look for evidence of financial instability brewing you would not find it in key areas: over valued asset prices, high leverage and rapid credit growth. She and the FRB did not see those imbalances and despite weak growth would not describe what we currently see in the US as a bubble economy. Perhaps the question was the wrong one. The bubble, indeed most bubbles, are financial in nature and relate to both the flow of financing and the current stock of financing. We are always in a bubble to some extent given that one of the key facets of the monetary system is the discounting of the present value of future flows through the allocation of assets, principally of money relative to all other assets. Today’s differential between what the economy can produce over time and the value and supply of assets that represent the future expenditure flows from our economy, are I believe, in excess of the present value of those flows. Part of this is due to monetary stimulus designed to drive growth forward in the face of demographic change, increasing income inequality (which weakens the expenditure base of the economy) and important transitions in key emerging economies that have numerous structural relationships. We are in a bubble and while the economic issue today is one of a deflating frame (i.e. not one with inflationary characteristic usually associated with economic overheating), the differential between the financial frame and the economic has arguably never been so wide. Perhaps the Federal Reserve should have defined what they believed to be a bubble or rather the moderator should have been a bit cleverer! Some may say that excess financial leverage of households has moved back to more sensible levels: the following chart shows that consumer debt levels have moved back to early 2004 levels but that these levels were associated with much higher longer term real GDp growth rates. In this context debt has not really fully adjusted. 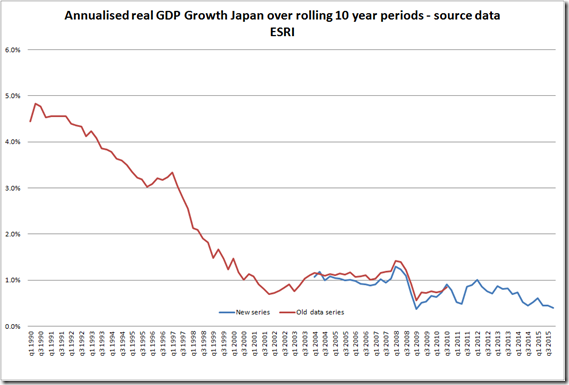 Japan has been at the forefront of weakening GDP/wages/growth, deteriorating demographics, elevated sovereign debt and extreme monetary policy. Of all the major economies, given its existing debt burden and aging population, Japan is arguably the closest to Helicopter money. Why do economists like Paul Krugman completely ignore financial imbalances and their structural accentuators? In a recent post Paul Krugman challenged the “rationale” for the Minneapolis Fed appointment of Neel Kashkari. His objection lay with “the view” of the new chair (Kashkari) that growth prior to the breaking of the financial crisis was artificially fast due to the leveraging of the economy. Krugman’s point was that just “because we had a bubble, in which some people were borrowing too much,” does not mean that the output produced from 2000 to 2007 wasn’t real and therefore the problem we have now is 100% one of insufficient demand as opposed to supply. 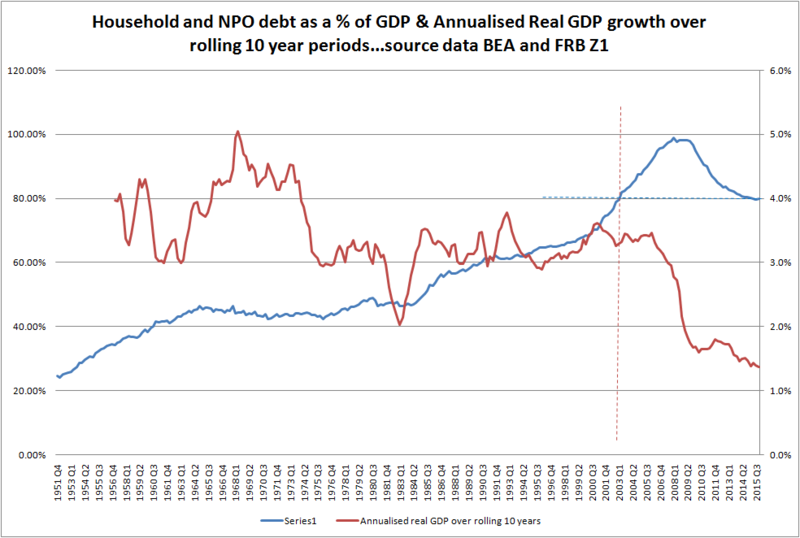 A brief “thought” on debt defaults, asset prices, MS velocity and consumption expenditure risks. When a private non bank debt collapses the money supply itself is not impacted. There is however a collateral impact on future expenditure and the velocity of money supply itself. Asset values are extremely sensitive to portfolio cash allocations. A given reduction in preferred cash holdings relative to other assets, all other things equal, raises asset prices by a much greater magnitude and vice versa. However not all transactions represent closed loops: a disposal of an asset for future consumption transfers asset focussed money supply to consumption focussed money supply. With money also being transferred in to the asset portfolio the net impact on asset values of consumption related transactions tends to be much smaller. A default in non bank debt, or loss of any asset, should therefore have an impact on future MS velocity and expenditure while also possibly increasing the asset focus of money supply (all else being equal). In the event of default, assets/collateral are no longer available for sale in exchange for money for consumption expenditure purposes (and of course investment expenditure purposes) and the potential velocity of money supply falls, specifically with respect to consumption and possibly also with respect to assets. Likewise a fall in asset values, especially the significant declines seen in recent decades, also impacts expenditure and MS consumption focussed velocity. Typically asset price declines have been short lived and given the fact that marginal transfers out of the global asset portfolio for consumption purposes has tended to be small in % terms, the impact of price declines etc on expenditure has also historically been small – this is especially so where asset focussed money supply growth has been expanding, demand for assets have been expanding (+ve population growth and demographic dynamics), where there is increasing income inequality (less MS flows out of the asset portfolio etc), but much less so in the reverse scenario. QE on the other hand has tended to focus primarily on supporting the financial system and high quality assets with minimal risk of default. Whether it impacts expenditure decisions depends on the liability profiles of asset holders in general. In a world of increasing income and wealth inequality asset price support may have only declining marginal benefits for consumption expenditure even though the resulting increase in asset focussed MS has affected a much wider range of asset prices. QE and low interest rate policy may well have supported potential expenditure based relationship loops from assets to consumption via asset price support based solely on asset valuations (not re yields) but may also, via increased risk taking within the higher yield/shadow banking asset spectrum, have increased the consumption sensitivity of assets; higher yielding assets are likely to be more consumption sensitive than lower yielding equity type assets. Increased exposure to leveraged loans, emerging market debt, high yield bonds, collateralised debt/loan investments, “wealth management products” (China) etc, exposes future consumption expenditure to higher default based risks, especially in high debt/low growth environments. This depends on the extent to which QE has pushed investors out of lower risk higher yielding assets into higher risk/relatively higher yielding assets and the changing composition of the market portfolio especially with respect to those investors exposed to higher future liability demands. Higher asset prices in low growth environments with increasing debt to GDP ratios also exposes consumption and investment expenditure to greater asset price volatility: we have seen quite extreme fluctuations in asset prices since the late 1990s. As populations age the sensitivity of expenditure to asset prices increase. The issue of default and asset price shock is compounded by issues of liquidity, especially with regard to many shadow banking products that investors may confuse as being cash like and therefore exposed to greater liquidity risks in risk events. It is probable given the higher debt to GDP ratios, slower growth profiles and the many transition risks in the global economy, that global asset price consumption risks are not insignificant. Another reason to support asset prices, another reason for QE and negative IRs, but not necessarily a solution. The China Crisis may be signalling the end of the “rationale” for zero lower bound asset price support. I do not think that anyone really suspects that we are at the start of an aggressive tightening of interest rates by the Federal Reserve. A 1/4 point increase in rates would be unlikely to do anything much to growth even at today’s relatively low rate of GDP growth. In truth, the problems with GDP are not necessarily to do with interest rate costs in the sense that growth is not being held back by the cost of money. Today’s low interest rates are here pretty much as part of an asset price support operation, as is QE. The reason why they have remained so low, post 2008 (in the US at least), is because of the increasing importance of asset market stability (given debt levels) to the financial system in a low growth, post financial shock, environment. As such, interest rate and monetary policy have been supporting the asset price/GDP disconnect post the financial crisis on the assumption that the shock to growth was temporary and transitory. Unfortunately the impact of the financial crisis on growth was neither, partly because debt levels were higher than could be supported by GDP growth pre crisis, but also because underlying growth, ex monetary/debt stimulus, was declining, for a number of reasons. Post crisis, what we have had globally is an increase in debt levels, while pre crisis growth levels have not recovered. The temporary asset price support operation has lasted longer than expected and has facilitated a further increase in asset focussed MS (increasing instability of the financial system), asset prices and asset focussed debt. Do interest rates need to rise to prevent inflation surging ahead in the US economy? Wage growth remains weak and there does not appear to be material capacity constraints at any level. The only real concern is rising consumer credit: consumer credit relative to income growth, especially non revolving credit, has been rising at historically high levels post crisis. This hearkens back to fundamental issues in the structure and distribution of key growth drivers that are independent of interest rate factors. 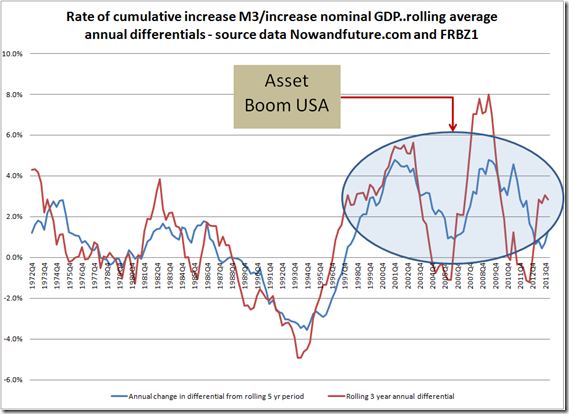 Low interest rates/QE have enabled further divergence between assets and debt and GDP and income growth, something that I do not believe was originally intended by Fed monetary policy. The key decision factor for the Fed is not whether this is the right time to raise interest rates at an economic level, but whether there are other more critical forces restricting growth and, as such, whether it is prudent to continue to juice asset/debt markets. In a low growth environment a ZLB interest policy is only going to create further divergences between asset prices, asset focussed MS/debt and GDP and other key flows supporting GDP. I also believe that China’s current problems are signalling an end to the belief that weak growth post crisis was temporary and that unconventional and unusual monetary policy supporting asset prices/debt was valid and the risks containable. Otherwise, well, interest policy is no more than a “hope and pray” one that supports the build up of market and financial risks relative to growth. Thus the Fed when deciding whether or not to raise rates is ultimately deciding the size and timing of the end game: a greater risk later or a lesser, but by no means small, risk now. I suspect the Fed realises it has delayed a rate rise for far too long, but I also question whether it wishes to sustain the impression that it can be swayed by short term market movements forever. Does it want to be looked upon as Sisyphus eternally dropping the interest rate ball? Making sense of US employment data and the interest rate decision. We have relative strength in certain sectors supported by a steady increase in employment and growth in consumer credit. The backdrop is weak domestic productivity and income growth, an unsettling composition of employment growth and global economic weakness, in particular a possible global trade shock centred in China. The US is still growing slowly and while there are signs the labour market is tightening there remains considerable structural slack and remaining structural imbalances of concern. A rise in interest rates may well be needed in the light of growth in consumer credit, but I have concerns over the fact that wage growth has yet to ignite, that capital investment expenditure remains weak and that the Federal Reserve’s own views of economic growth potential may well be above that which the economy itself is able to produce. Has the US economy returned to the normalcy envisioned by policy makers and with it its interest rate setting policy? I think not, but I also feel that the divergence between income growth and consumer credit growth is a considerable problem and one that may come back to bite the US if China weakens further. Has demand moved to a level that would generate capital expenditure that many feel is necessary to push growth back to higher levels and would a rising interest rate scenario cut this particular and necessary part of the cycle short? This critical intersect may be a key consideration in any interest rate decision. A Foray into the Fundamentals of Austerity in Anticipation of the Outcome. A recent IMF report pointed out some supposed vast amounts of room available for the world’s economies to step up government borrowing to finance consumption, investment and production decisions. Oddly the report appeared to ignore other forms of debt and material deterioration in key areas of the economic frame. When the crisis broke back in 2007 it was clear to me that monetary and fiscal policy would likely need to go for broke to support economic growth and employment at a time of collapsing asset values, debt defaults and a world wide retrenchment in expenditure of all kinds. As it happened a great deal of that support went into asset prices and financial institutions. But some years after the crisis, after a slow and drawn out recovery with interest rates locked to the floor, economies still appear to be borderline reliant on debt financed government expenditure. Any attempt to reduce borrowing, to either raise taxes or cut expenditure to pay back debt would be considered by many to have an adversely negative impact on economic growth, especially at such low growth rates. Not a “Savings Glut” per se but a monetary excess amidst a period of complex global structural economic change! 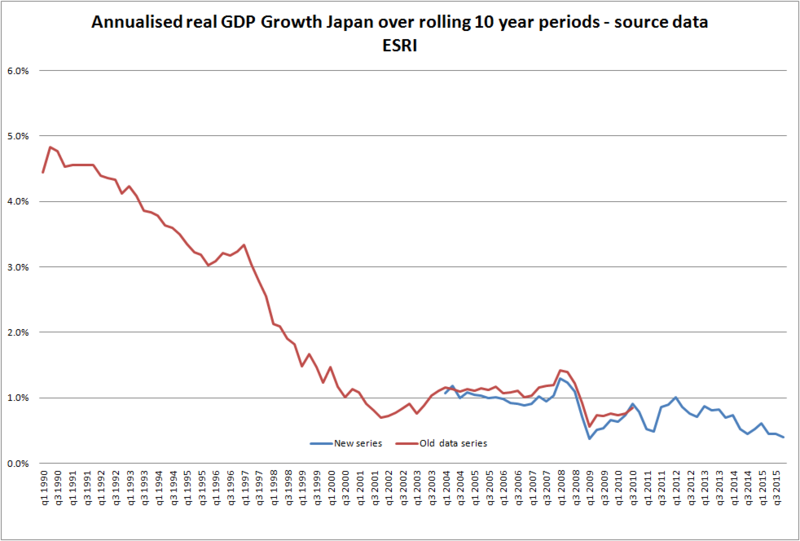 If you stream through the data it is pretty clear that developed economy growth has been slowing for some time and that monetary policy has accommodated this adjustment with lower interest rates and a relaxed attitude towards money supply growth. At about the same time these trends were moving ever closer to their sweet spot on the horizon (because we are not yet at peak of this particular movement) certain developing markets really got going, with the help of a fair amount of their own monetary stimulus but also by a reconfiguration of global supply chains and offshoring in key economies. All factors combined to create a heady and dangerous global financial imbalance, a weak bridge cast across a widening economic divide. No wonder it all came crashing down..but who was to blame? The world’s central bankers who were blindsided into excessively lax monetary policy by a low inflationary world that had become obsessed with laying off and chopping and dicing of risk to those “who could best absorb and bear it”, or some of the finer strings in the mesh? Well, some have chosen to blame excess savings in the emerging/developing part of the world, principally China, but this is all too pat. The “savings glut” theory, if you can really call it “excess savings”, was merely a return of serve of part of the vast ocean of financial and monetary excess that barrelled through the early to mid 2000s. In a recent speech Andy Haldane of the Bank of England suggested that interest rates may well need to fall as opposed to rise following on from recent falls in inflation. I would agree that the secondary impacts of price declines need to be seen before we can assess whether or not these price falls could indeed trigger stronger deflationary forces. For one, price declines may lead to lower revenues (note US retail sales) and lower revenues may impact on wage increases. Secondly, lower revenues impact cash flows and cash flows impact asset prices, especially for high yield debt in sensitive sectors. Global markets remain especially sensitive to asset price movements and factors which may impact asset prices. Thirdly, we are in a complex deflationary frame where aging populations, slowing population growth and relative weakness in corporate investment (note buybacks) is already a significant drag on the global economy. Falling prices could well trigger latent dynamics in this structure. And finally, areas of the world which could well create the demand necessary to reinvigorate the frame, for example China where growth appears to be slowing sharply, may also be adding to tensions within the global growth frame. So yes, interest rates could fall, in the sense of defending asset prices and attempting somehow (I do not quite know how) to reinvigorate or at least support demand, or rather maintain marginal cash flows. But in reality we do not know because we lack at the moment a measure of the sensitivity of the frame to short term shocks of any financial or economic nature. We know the frame is weak and has been for some time but as to its sensitivity, we know very little. The Fed is slowly shaking the tree, but will it start to climb? Over the last 20 or more years interest rates have fallen, for reasons other than falling inflation, and as interest rates have fallen so has nominal growth in a great many developed economies, and so has inflation fallen further. On the other hand debt has risen and so have asset prices, quite remarkably so in fact. But through this period we have also had a succession of financial and economic crisis, with the risk mostly of a financial nature, and in response to these asset price risks, interest rates were either cut or held low for, in my opinion, far too long. The Fed would now like to raise interest rates, and so too would other seemingly “well on the way to economic recovery nations”. The trouble is the “economy and our markets” are now more than ever sensitive to changes in interest rates. The Fed partly knows this, is partly concerned that interest rates lie at close to zero (and unless they want to go negative, a place they probably worry they may never climb out of) would like to see them a bit higher, to allow them to cut interest rates in a subsequent crisis. In the last cycle the the Fed Funds rate rose to 5.25 and currently loiters around the 0.11 to 0.12 range. I would suspect that a Federal Funds rate of 4% was too high for the last upward cycle and would also posit that rates would be hard pressed to rise above 2% in the current cycle before we saw the type of wrenching market reaction…but this all assumes everything else being equal. Markets are too well worn around the interest rate, money supply asset price equation to lay back and wait for the interest rate cycle to hit economic growth. The question is though how much of an asset price shock can the “economy take as interest rates rise before that asset price shocks impacts the economy? I guess that is the question and the Fed is trying to work out just how sensitive the world is to a rise in interest rates. It just does not know and while the risk of rising rates may be extremely high it may well have figured that “the Fed’s got to do, what the Fed has got to do…”. As many other commentators have pointed out, a whole panoply of other risks have started to move out of the closet (namely the many risks posed by a sharply appreciating US dollar), risks that may already constrain the Fed from acting. Current rates on 5 year treasuries are around 1.5% and stood at some 4% in early 2007. I would have thought that the peak rate for the Fed rate would be around this level at the current juncture, but just how to get through to it is the question? In a recent post,”There’s nothing left-wing about a higher inflation target”, Tony Yates called for an increase in the Bank of England’s inflation target from 2% to 4%. Raising the inflation target for some reason would allow for higher interest rates that would provide the necessary leeway to combat economic downturns without being hemmed in by the zero lower bound. While I do not necessarily agree with the statement I do agree with the dynamics that quite possibly underlie it. Yes, if the inflation target had been higher central banks may not have been as aggressive keeping inflation under control and possibly inflation may not have fallen to current levels. Interest rates may therefore not have trended down from the early 1990s to their pre crisis levels. If interest rates had not moved downwards over this period then it is likely that we would have seen much less asset focussed debt creation and the foundations of the crisis that led to a precipitous immediate drop in growth and weaker growth post crisis would likely have been somewhat curtailed. The fact interest rates are hemmed in at the lower bound though has more to do with the dynamics of high levels of debt and their relationship with high asset values amidst the constraints of low economic/income growth. In other words it is the past that has the greater weight, not the future. So yes, clearly, without the debt accumulation and with higher interest rates we would possibly not be at this particular chokehold. But, interest rates did not fall solely because inflation fell, they fell because growth rates were also falling and because of a number of financial shocks to growth starting in the late 1990s. In a sense interest rates fell to stimulate growth and anything that stimulates growth also risks stimulating inflation. That it did not is a very moot point. In reality, all other things being equal, where inflation is caused by imbalances between supply and demand, the higher the inflation target you have the lower the interest rate target, and since I believe that lower interest rates have helped foster successive financial bubbles I am concerned over the integrity of higher inflation targets per se given the dynamics. I would have preferred higher interest rate targets and less monetary stimulus even if this had meant a lower growth trajectory. I can see little wrong with low inflation within a structurally stable economic framework. But let us suppose the argument is one of expectations and by raising the Bank’s own inflation targets so will the general public. I think if this was the case the article should have clearly expressed it. I do not personally feel that today’s deflation is led by individuals delaying expenditure in the expectation of lower prices tomorrow, although this does not mean it could not start to happen. The question is, after all the best efforts of central banks the world over to stimulate growth over the last 20 years have led to the present moment in time of low interest rates and falling prices, how will putting an expectation of higher inflation into CB policy actually raise both inflation and interest rates? Perhaps by raising inflation expectations we may cause consumers to spend more and save less. But this assumes that people are spending less than they are capable of (the wealthy “1%” perhaps, but do they need to spend more?) as well as the fact that deflation is impacting the saving/spending decisions of consumers. Personally I would rather have seen a higher interest rate framework and reduced asset focussed money supply growth with lower potential inflation implications than the situation we are currently in. It has less to do with inflation and more to do with structural economic integrity. Trying to stimulate expenditure via every manner possible has led us into all sorts of problems. Something changed some time way back and we have been edging in spurts, lunges and various headlong gallops to yet higher precipitous vantage points…the valleys along the way have also yielded some many interesting experiences….whether this change was a structural process that started some way back in the 1980s (secular stagnation and there are indications this could be the case), or the consequence of a misplaced emphasis on maintaining the stability of the business cycle in the late 1990s (LTCM, Asian Crisis..again consequences of this are clear), that saw central banks lowering interests rates to maintain the growth cycle, or the increasing levels of consumption and debt and widening wealth and income inequality that came hand in hand with lower interest rates and more “stable” and longer growth cycles and or financial deregulation, is a part of the overall complexity of the matter. High savings can mask complex debt spirals: brief addendum to differences between debt and saving.. In a recent blog I touched on issues of definition with respect to savings, debt and money supply. A recent blog by Michael Pettis also touched on excess savings in high growth, debt driven, over extended gross fixed capital investment led cycles…phew. Today Jesse Colombo @thebubblebubble tweeted that “bubbles can form with 100% down payments. Credit is not necessary to form a bubble”. It is an interesting point. You can get a localised bubble without credit/debt expansion and this is where consumption demand and/or asset focussed demand plonks itself overly on one particular sector of economic activity or asset class. This would draw resources/demand away from other asset classes or other economic sectors. But it would show up in relative demand for other asset classes and other areas of demand. In other words some areas would deflate and others would expand. The damage as the bubble burst would be due to misallocation of resources, if this impacted capital and human investment allocations, or merely a revaluation of asset classes. Money supply and monetary transmission are important entities and functions within our system. Usually, even broad money supply is well defined, but I was getting to thinking about shadow banking assets and the identities they may have in the minds of those who supply the funds. Shadow banks are not deposit takers so they do not actually hold “money”, but they do hold assets that their investors may consider to be money like, i.e high yielding cash substitutes, within their portfolios. Now if perceived money supply is actually higher and we have an asset price shock, we also have a monetary shock by default. Now this is just a quick “throw the thought out in the air”, but if the shadow banking system is also messing with identities and virtual money supply, things may well be more complex than we think they are as things start to unravel. Many of the points I made in my choke point blog are also reflected in the latest Geneva report, Deleveraging? 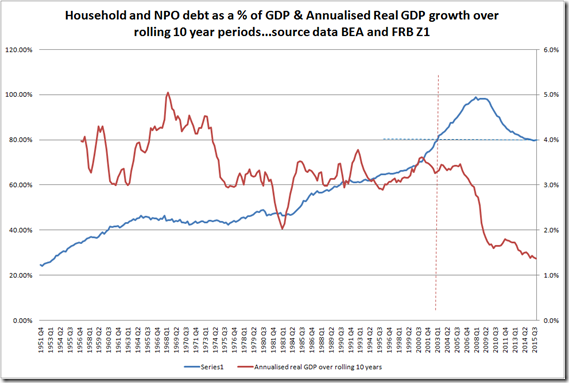 What Deleveraging? One thing I would like to touch on before I highlight excerpts from that text is that high levels of debt and misallocations of capital may well be a feature of many a boom, but what makes the current situation much different is the fact that interest rates lie on a lower bound, almost incapacitated by a higher bound debt level, itself tied to highly valued asset markets. High debt levels and weak growth dynamics are dangerous, irrespective of whether you are undecided as to whether high debt led to growth or low growth to high levels of debt, although I tend to believe that the reality is that weakening developed economy growth dynamics accompanied the debt build up prior to the onset of the crisis. Beyond that point in time, high debt levels I would say are clearly impacting growth. Whereas all significant debt misallocations have an impact on subsequent bank lending and new credit growth (the stock of broad MS is tied to these low or non performing loans), not all such instances have occurred at such low interest rate levels. I think this is key, critical and as the Geneva report suggests “poisonous” intersect, although the report itself strays from emphasising what I consider to be the greater risk of high debt levels at low IRs..
Another point that I have laboured is the present value of future output growth or national income relative to debt is out of balance and this is the first time I have seen explicit reference to this in any other document I have read. The primary interest rate conflict is not between inflation and growth, but between asset prices and a potential asset price shock to growth and the financial system. Increasing income inequality and weak wage growth keeps the US and other economies within a debt/asset value/IR bounded endogenous money supply chokehold. A successive series of debt/asset bubbles and interest rate lows are not a succession of unrelated incidents but a tightening of an extremely dangerous grip. In the most recent Federal reserve Bank of Chicago Missive, Patience Is a Virtue When Normalizing Monetary Policy, much interesting information was imparted on employment trends…but there was little comment about interest rates and their relationship with the build up of asset focussed money supply growth……this build up of broad MS was and still is reflected in highly valued asset markets and global debt accumulation. 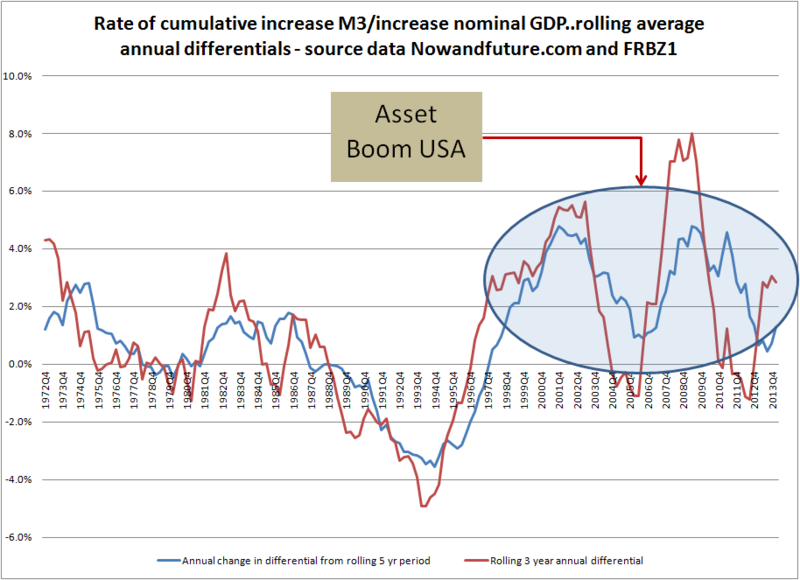 Its magnitude can be gauged by the large surge in broad MS growth over and above nominal GDP growth. I foresee a time when a policy dilemma might emerge: Namely, we could find ourselves in a situation in which the progress or risks to one of our goals dictate a tightening of policy while the achievement of the other goal calls for maintaining strong accommodation. One point that is worth pointing out is the extremely large increases in money holdings in the US economy, especially over the last 12 years with regard to their differential with nominal GDP growth. I dealt in detail with the physics of changes in money supply and its distribution between expenditure and asset portfolios in a document I wrote in 2008. What is money, how is it created and what impact does QE have? For anyone a bit hazy on this topic the Bank Of England provides a good explanation in its latest quarterly report. Central Bank Reserves, Quantitative easing and leakage.. some questions of mine. US Central Bank credit has increased 1.075trillion (End 2008 to 1 May 2013) and reserve balances with the Federal Reserve have increased 958bn over the same time frame – source data H8 and H4.1 reports of the Federal Reserve.